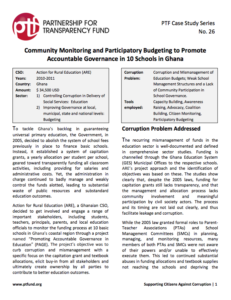 To tackle Ghana’s backlog in guaranteeing universal primary education, the Government, in 2005, decided to abolish the system of school fees previously in place to finance basic schools. Instead, it established a system of capitation grants, a yearly allocation per student per school, geared toward transparently funding all classroom activities, including providing for salaries and administrative costs. Yet, the administration in charge continued to badly manage and weakly control the funds alotted, leading to substantial waste of public resources and substandard education outcomes. Action for Rural Education (ARE), a Ghanaian CSO, decided to get involved and engage a range of important stakeholders, including students, teachers, principals, parents, and local education officials to monitor the funding process at 10 basic schools in Ghana’s coastal region through a project named “Promoting Accountable Governance in Education” (PAGE). The project’s objective was to curb corruption and mismanagement with a specific focus on the capitation grant and textbook allocations, elicit buy-in from all stakeholders and ultimately create ownership by all parties to contribute to better education outcomes.